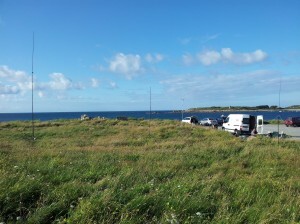 Between 26th and 31st July 2012 M0PCB and M0GEJ had the pleasure of travelling to Guernsey. There were two main aims for this trip. 1) Have a relaxing camping holiday with a group of friends. 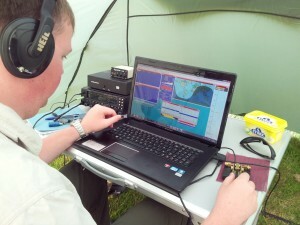 2) Enter the IOTA contest with the MU0HTJ team. 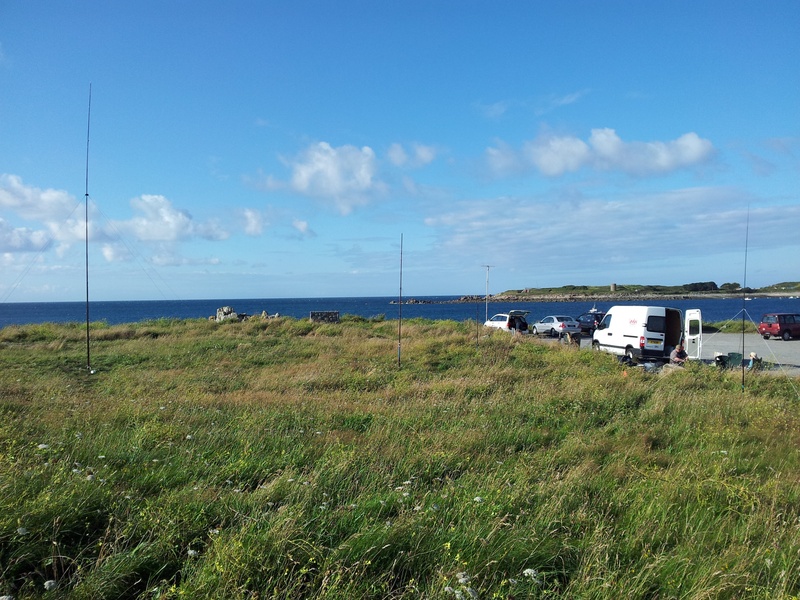 We were camping at The Vaugrat Campsite in northern Guernsey and Louis 2U0FER had managed to arrange permission to erect a 12m fibreglass pole and doublet for us to use outside of the contest. Outside of the contest MU0PCB/P made 207 QSOs using 50W from an FT-450 (supplied by 2U0FER) and a 40m long inverted-vee doublet. MU0PCB/P operating from the campsite. 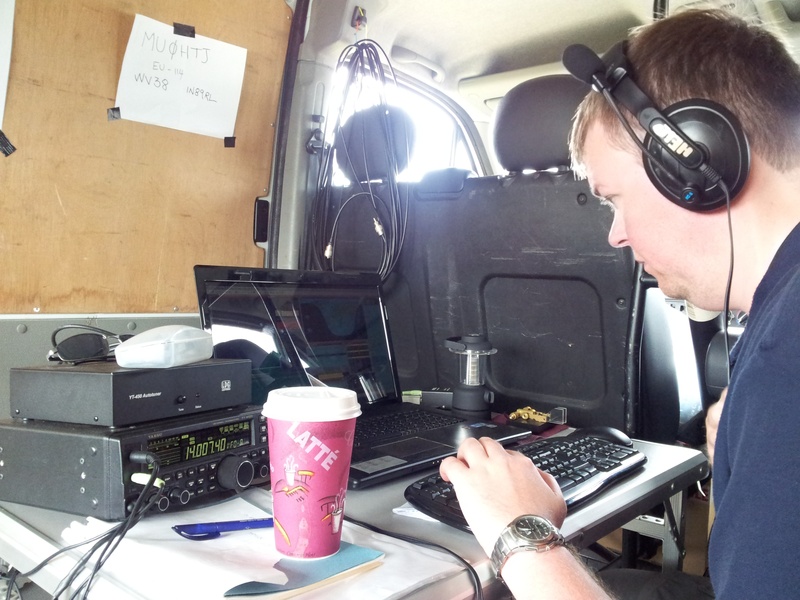 In the contest MU0HTJ made 1038 QSOs and claimed a score of over 1 million points, a step up from the previous years entry from the HTJ team, though Chloe and I were not present for that event. I spent my time on the air in the contest on CW, and worked over 400 QSOs for the team. We were using Louis’ FT-450 and wire verticals for 80m, 40/15m, 20m and 10m. M0PCB on the key on 20m during Sunday morning in the contest. As soon as the Kiosk opened a large coffee was procured to keep the operator focussed! The MU0HTJ antennas, (l-r) 40/15M, 20M, 10M and then a small receiving antenna. The van was the shack for the 24 hour contest. 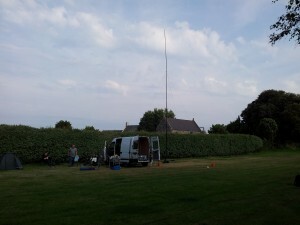 The antennas went up and came down very quickly, we managed to tune the lengths at the campsite the previous day to reduce time required to set up and get on the air. It would have been better for us to have CW on more bands than just 15m and 20m, something to look at next year. Certainly a very enjoyable and worthwhile trip. Look out for MU0HTJ again in 2013! MU0PCB QSL cards will be printed as soon as possible and all QSOs confirmed via the bureau. Logs will also be uploaded to Club Log and LoTW as soon as practical.